I began to pursue the craft of woodworking and furniture design after seeing an exhibit featuring the work of contemporary designer craftsmen in 1962. Subsequently I visited the workshops of the furniture makers whose work I saw and admired in the exhibit and I eventually worked in the shops of two of those craftsmen. 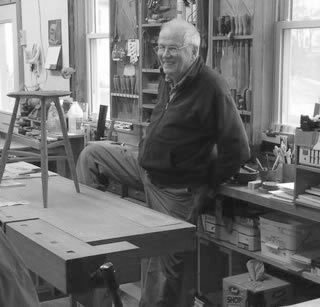 In 1965 I moved to Henniker New Hampshire and began establishing myself as a woodworker designing and making furniture. I have been a juried member of the League of New Hampshire Craftsmen since 1965 and was a founding member of the Guild of New Hampshire Woodworkers. In 1993 I moved my workshop in Warner New Hampshire to midcoast Maine where I continue to design and make contemporary furniture on commission.